In 1953 Barber turned to the writings of the nineteenth-century philosopher Soren Kierkegaard, whose works he had long known and studied. When Barber accepted Koussevitzky's comission, Kierkegaard's religious views, presaging modern existentialism, were very much in the spirit of the times, Barber remarked: "His name was practically unknown in our country until the late 1930s, even though a Kierekgaard renaissance had been in full swing in Europe during the previous quarter of a century. Then in the decade after 1936 almost entire body of his writings appeared here. American readers soon became aware of Kierkegaard as a major literary figure and an exciting but enigmatic intellectual force. Interest in him was further stimulated after World War II by reports about his influence upon the leading Existentialists. Indeed the contemporary philosophers, Satre, Jaspers and Heidegger, have all paid tribute to the 'autumnal man'. Thus Kierkegaard's thought bacame a great force in our religious life even as it had become in Europe. It became the father of both the 'crisis theology' in Protestantism as well as of 'atheistic' Existentialism." Barber selected prayers interpolated through Kierkegaard's writings and sermons written between 1847 and 1855. The music is rich and varied, beginning with a single thread of chant-like melody, that gives way to the full orchestra and chorus. 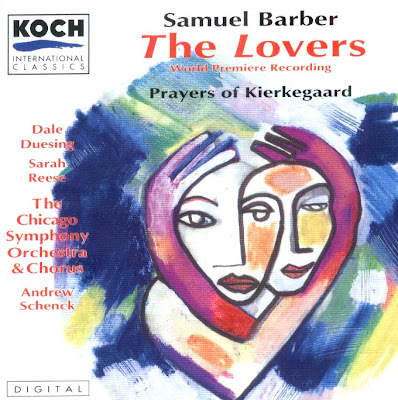 A slow prayer for soprano solo over a square accompaniment - like the gentle rocking music from Knoxville: Summer of 1915 - also grows into music of contrapuntal richness. At the climax the orchestra continues alone with an almost savage intensity, then dissolves into a final broad chorale. The Prayers of Kierkegaard is one of the chief glories of Barber in his prime. The CD was released by Koch International Classics, 1991, (DDD). Koch 3-7125-2H1.